DETROIT, Jan. 18, 2019 /PRNewswire/ -- DTE Energy is launching a $900,000 education program to inform the public – children in particular – about downed wire safety, and will provide funding to purchase electrical safety equipment and train local fire departments across Southeast Michigan, the company announced today. DTE developed a comprehensive strategy to further emphasize public safety and educate residents about downed power lines following the Michigan Public Service Commission's investigation into the May 4, 2018 wind storm. Tragically, a customer who came in contact with a downed wire died. "Safety of the public and our employees is always DTE's No. 1 priority, and this new education and training program enhances our downed wire safety commitment," said Heather Rivard, senior vice president, Distribution Operations. "Our post-storm assessment revealed an opportunity for a stronger emphasis around educating our customers about what to do if a power line falls. Touching a downed wire can be deadly and we need to make sure our customers know this; nothing is more important than their safety. The program, agreed to by the Michigan Public Service Commission, provides the framework for us to make a positive impact on the safety of our customers." "We are exploring every avenue at our disposal to share our safety messages. We are proud to power Southeast Michigan, and we want to make sure the public stays safe around electricity," Rivard said. 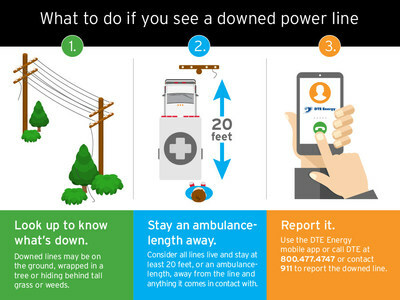 DTE reminds its customers that if they see a downed power line, stay at least 20 feet away and report it, either through the DTE mobile app or call 800.477.4747. For additional information about electrical safety, please visit dteenergy.com/safety. DTE Energy (NYSE: DTE) is a Detroit-based diversified energy company involved in the development and management of energy-related businesses and services nationwide. Its operating units include an electric company serving 2.2 million customers in Southeastern Michigan and a natural gas company serving 1.3 million customers in Michigan. The DTE portfolio includes energy businesses focused on power and industrial projects, renewable natural gas, natural gas pipelines, gathering and storage, and energy marketing and trading. As an environmental leader, DTE will reduce carbon dioxide and methane emissions by more than 80 percent by 2050 while keeping energy safe, reliable and affordable. DTE is committed to being a force for good in the communities where it serves through volunteerism, education and employment initiatives, philanthropy and economic progress. Information about DTE is available at dteenergy.com, empoweringmichigan.com, twitter.com/dte_energy and facebook.com.